Eugene Whelan, 31, was the ninth of ten children. Being a firefighter was a lifelong dream. Whelan knew he wanted to be a firefighter since he was ten, and he made his dream come true in 1995. With lots of nieces and nephews (and being a big kid himself), Whelan was “everyone’s favorite uncle.” At the firehouse, neighborhood kids brought their bicycles by for him to fix. Sometimes he even dragged the chalkboard outside and gave impromptu lessons. He kept extra winter jackets in his jeep to give to a shivering homeless person should he see one. One of his brothers was sworn in to the FDNY in the first class that graduated after 9/11. 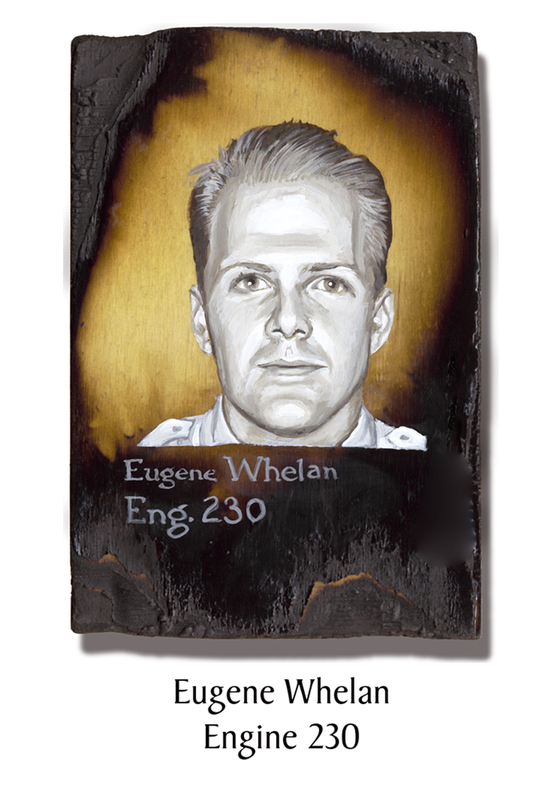 This entry was posted in Better Angels Stories and tagged 343, 9/11, better angels, Dawn Siebel, Engine Co. 230, Eugene Whelan, FDNY, firefighter, firefighters, firefighters of 9/11, LODD, Manhattan, memorial, NFFF, paintings, portraits, World Trade Center, WTC. Bookmark the permalink.